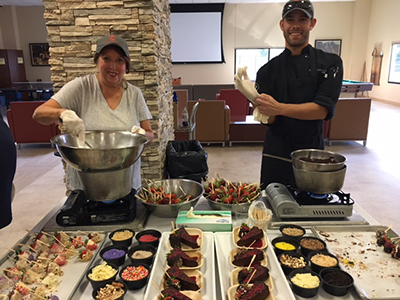 Veterans at Valor Point Domiciliary in Denver, Colorado were treated to a very special dinner thanks to Soldiers' Angels volunteers and Epicurean Catering Denver. The chef-prepared dinner featured artesian bread, braised shredded short ribs, creamy mascarpone polenta and more. Needless to say, there were NO leftovers after this event thanks to the delicious menu created by Chef Bob and the wonderful staff at Epicurean! The attending veterans enjoyed the meal very much! Check out photos from the dinner here.